Welcome to Regal Estates of League City, a gated community dedicated to our residents’ quality of life above all else. Located mid-way between Houston and Galveston, a few minutes from several Marinas and the famous Kemah Boardwalk, we pride ourselves on our warm, family atmosphere and varied activity program. We offer plenty of opportunities for stimulation, fun and socialization, along with an unmatched level of personalized Assisted Living care. We invite you and your loved ones to visit our resort-style community and see for yourself what you’ve been missing. Along with being one of the most affordable communities in this area, we are more than an Assisted Living, we are Family. There is no substitute for experience and we have a dedicated team of employees, many of whom have been at Regal Estates for several years. That’s what makes us different, and that’s why so many residents and staff call Regal Estates ‘Home’. Walk through our front door and you will be struck by our warm, homey and vibrant atmosphere. On top of that, with almost 20 years of experience, award winning care and deficiency free surveys, our reputation says it all. Feel free to stop by the game room for some pool, air hockey, or foosball. For more physical activity, you might want to visit our state-of-the-art exercise gym, where residents receive physical and occupational therapy. If you’re feeling hungry, we have three separate dining rooms to choose from, where residents enjoy fresh, locally sourced meals with friends and family. To walk off your meal, we suggest a stroll along the walking paths in either of our beautiful courtyards. Should you ever want or need to venture out of our community, our transportation service can take you to church, the mall, the movies, museums, the NASA Johnson Space Center, and Houston’s best hospitals. Our League City assisted living residents and residents’ families receive valuable peace of mind knowing that there is a licensed nurse on staff and in the building 5 days a week. In addition we have ready to care, awake staff in the building 24/7. Every resident enjoys amenities such as an emergency response system in each apartment, an on-site beauty salon and barbershop, housekeeping, laundry services, and beverages available throughout the day. When residents need assistance with daily activities, we provide the care services in the comfort and privacy of their apartment. While some communities insist on new residents plopping down huge, non-refundable payments up-front, we like to do things a little differently. We care about not only the physical and emotional well being of our residents, but their financial health as well. That’s why we offer our residents all the perks of senior community living without the expensive buy-in—just a simple lease. Our community consists of 142 spacious apartment homes with varying floor plans and amenities described above. Angela brings over 10 years of experience in the senior housing industry to her role as Executive Director of Regal Estates of League City. Since joining the Senior Lifestyle family in 2013, her favorite part of her role has remained the same. Angela is also proud of the family atmosphere her community fosters each and every day. Angela moved to Texas from the UK in 2008 and spent five years working in the hospice industry after her time as a Project Manager for the UK’s first telephone & internet bank. Among other accomplishments, Angela holds a Masters degree in French, and enjoys acting, singing, book club, seeing musicals and eating out. She’s excited for you to visit Regal Estates of League City for yourself! 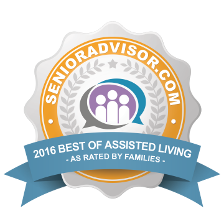 Regal Estates at League City was voted Best Assisted Living Community for 2016 by the readers of the Bay Area Citizen, among many other awards. We invite you to stop by to see what makes their community stand out among the rest! Mom moved here a few weeks ago from another Assisted Living Facility. What a world of difference in the Care, Atmosphere, Staff, Food, Apt, Price, etc. SOOO very glad we made the decision to move Mom to Regal Estates. I was very impressed with Regal Estates. Everyone was extremely friendly and went out of their way to make us feel at home and very comfortable. I have visited several times prior to the move in date of my family member and each time I have experienced the same friendliness and warmth. The building is clean, bright, and very airy. The two-hour window for the meals is amazing. The main thing that sold us on Regal Estates is the fact that all of the apartments are registered with the state as assisted, so if an independent resident develops the need to be assisted, he/she will not have to change apartments. After looking at several assisted living communities, Regal Estates was the only choice without question. Moved our Loved one here in February 2016. The staff made an otherwise painful move a breeze! Our loved one is adjusting so well. The family can relax knowing she is safe, being looked after, enjoying great meals with fresh veggies and salads, being stimulated with great activities and connecting with people on a daily basis. She is not home alone, day and night after day and night. She is thriving here thanks to the Fantastic Staff and Mgmt. Thank you to the Entire Regal Team! My dad has been at Regal Estates for about four months. His quality of life has greatly improved since he moved into the facility. The staff and personnel treat him like family or a dear friend. All that was promised by Regal Estates has proven to be true or better than foretold. Meeting with Angela Reader and working with her to find a home for my father has proven to be a great blessing for him. Also, those who have chosen to live at this location have become dear friends of my father. It is a wonderful place to live. God bless Regal Estates. I loved the Regal Estates. My loved one lived there. Three friends of ours moved in. I think it’s very welcoming to the residents. They want them to feel apart of their home. The facility is always very clean. The atmosphere is very nice and welcoming. The staff is very friendly, nice, and accommodating. Everything is excellent here. I would recommend the Regal Estates to anyone searching for a nice community. The Entire Staff at Regal does such a Great job of making Life at Regal Vibrant and Meaningful for its Residents. From fishing trips, creative fun exercise, interactive outings, yummy meals, to a sympathetic ear when needed, you guys make a beautiful, comfortable home to look forward to returning to. You guys Ace Assisted Living! This Family Member Sincerely Thanks You ALL for your every contribution!